Taxpayers have been saddled with a £4.8bn debt from the Channel Tunnel high-speed rail line (HS1) so far, a report by a committee of MPs has said. The Public Accounts Committee blamed over-optimistic forecasts about the number of passengers using the service. It predicted that the final bill for the London to Folkestone line would rise to £10.2bn by 2070. The Department for Transport (DfT) said passenger forecasting had improved significantly since work 20 years ago. International passenger numbers on HS1 are a third of the original 1995 forecast and two-thirds of the DfT's 1998 forecast, it stated. Committee chairwoman, Labour MP Margaret Hodge, said: "There was real over-optimism on the number of passengers they thought they were going to get. In fact, it's a third of the figure they originally thought because they didn't think about what the cheap airlines would do in competing, they didn't think about what the ferry boat industry would do, and they just got it wrong." The report stated: "Over-optimistic and unrealised forecasts for passenger demand on HS1 left the taxpayer saddled with £4.8 billion of debt." It also said the delivery of regeneration benefits from HS1 had suffered from a "lack of effective leadership". The DfT gave insufficient attention to evaluating its major projects, the report added. Ms Hodge pointed out that an earlier report into the East Coast main line had raised similar concerns about over-optimistic planning. And the report warned the same could happen with the far more expensive HS2 line from London to Birmingham. Mrs Hodge acknowledged HS1 provided an efficient service but warned the "costly mistakes" of the project must not be repeated with HS2. She said the DfT told her committee it had not considered the benefits and costs of alternatives to HS2 such as investment in more local train routes. "The department must revisit its assumptions on HS2 and develop a full understanding of the benefits and costs of high-speed travel compared to the alternatives," she said. 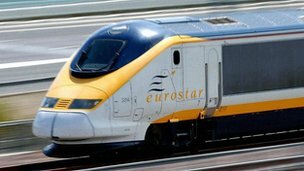 The first section of the HS1 line was completed in 2003 and the full line opened in 2007 for 186mph Eurostar trains between London, Paris and Brussels. It was originally run by London & Continental Railways (LCR) and was sold to a consortium for just under £2.05bn in 2010. A DfT spokesman said HS1 was a successful part of the transport infrastructure carrying millions of passengers a year to the south-east of England and the continent. He said it was delivered on time and on budget with the sale of it generating more than £2bn for the taxpayer. "Our passenger forecast modelling has improved significantly since the original work for HS1 over 20 years ago, with better understanding of what drives passenger demand, better computer modelling and more computer power to do it," he added.